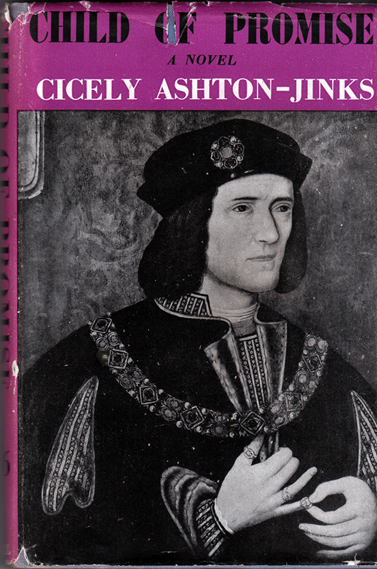 Description: In this penetrating novel, written in Ashton-Jinks' engaging and superb literary style, we see a more complex Richard III than the one we are accustomed to know. His character develops among scenes of pageantry. Warwick the Kingmaker, Henry VII and Margaret of Anjou all pass before our eyes. We see the glittering court of Edward IV, and learn about the houses of York and Lancaster during the Wars of the Roses. Amid all the alarms and excursions, the hunting and the hawking, the feuds and the loves of noble families, the figure of Richard stands force: a prince who was determined, and who achieved his end—to be a King. Dust jacket has a closed tear on the top edge (refer to image). Further nicks and scuffing along edges at rear and spine head. Negligible rubbing on spine; original price of 9/6 net printed thereon. Light soiling on rear. Blue cloth boards with black embossed text on spine. Corners straight; head of spine bumped. Discolouration to spine; part of the text (including the price) from the jacket has become impressed onto the spine. Despite having been printed on War Economy paper, the book is in excellent internal condition. Pages are very lightly tanned, but remain unmarked and completely free from foxing. Super-tight binding. Author has signed her name on the title page. There is also an interesting Voice of Britain propaganda statement on the rear flap: "In every part of the world you can hear broadcasts direct from Great Britain. In every part of the world truthful news has steadily defeated the Axis campaign of lies and slander…"
Measures 19 cm × 12.5 cm (7.6″ × 5″). Large 12mo. 266 pp.